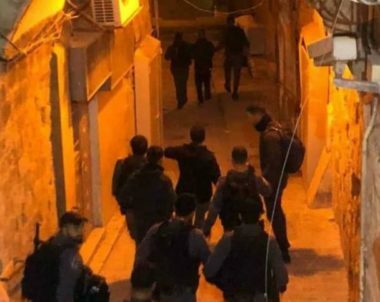 Israeli soldiers abducted, overnight, at least fifty Palestinians in several parts of occupied East Jerusalem, including the Old City, during extensive and violent searches of dozens of homes, and interrogated dozens of residents. Media sources said hundreds of soldiers and police officers have been deployed in the center of Jerusalem, the Old City and all areas surrounding the Al-Aqsa Mosque, ahead of Friday prayers in the holy site. They added that the extensive deployment in the area comes amidst massive nonviolent protests by the Palestinians demanding the army to reopen the gate of Bab ar-Rahma, leading to Al-Aqsa, and to return the situation there how it was until the year 2003 when it was officially considered part of the Al-Aqsa Mosque. The soldiers installed dozens of roadblocks on main roads, especially near the walls of the Old City, and around various surrounding neighborhoods and towns, before stopping hundreds of Palestinians trying to enter Al-Aqsa. Palestinian nonviolent activists in Jerusalem said the soldiers are holding the ID cards of all young men, wishing to enter the holy site for Friday prayers, and added that the soldiers and officers have placed even harsher restrictions and measures, an issue that forced dozens of Palestinians to hold dawn prayers in Bab ar-Rahma area. The Palestinian Prisoners’ Society (PPS) has reported that the soldiers abducted 50 Palestinians, mainly from Silwan, Wad al-Jouz, al-‘Isawiya and at-Tour, after storming and violently searching their homes. The soldiers also summoned for interrogation Mahmoud al-Jondi, Saleh Abu Assab, Abdullah Abu Assan, Mohammad Oleyyan, Rawhi al-Kalghassi, Tha’er Abu Sbeih and Abed Hamad Sinjilawi.